TORONTO -- (MARKET WIRE) -- December 7, 2006 -- Element 21 Golf Company ("E21") (OTCBB: EGLF) (FRANKFURT: BJQ) advised that its patented E21 Scandium Metal Alloy shafts have attracted the interest of other major golf equipment OEMs. A number of PGA Tour professionals have recently switched to, or are testing E21's unique shafts, causing a stir in the golf industry. As a result, some of the major golf equipment brands have requested sample shafts from E21 for their own performance evaluations at their labs. This evaluation process is still at the earliest stages, but speaks well to the potential impact E21's Metal Alloy may have on the golf industry as a whole. Tour professionals look for consistency of performance, shot to shot, and between different clubs. This pursuit of consistency, particularly in shafts has deterred players from switching from steel to newer graphite shaft technology. Tour Players continue to rely on the outdated steel shafted clubs for their iron play, rather than graphite shafts which cannot provide the same level of consistency. All steel shafts are rolled from sheets and welded creating a seam or spine not visible to the naked eye. The difference in tube wall thickness and strength parameters at the point of welding create an imbalance, which affects the consistency of shots. For this reason club makers use a process of Puring to limit inconsistencies. E21 Scandium Metal Alloy shafts have now raised the bar in terms of the consistency and do not require Puring, as the E21 shafts are perfectly symmetrical both in terms of roundness and strength. Using aerospace tolerances and a proprietary 25-step production process, each shaft is extruded from a single piece of metal with unprecedented accuracy. E21 Scandium Metal Alloy shafts are almost perfectly symmetrical at 99.5-99.9%, compared to 60-78% typical in graphite shafts and 80-85% for steel. The patented metal alloy used by E21 offers superior strength-to-weight ratios and the advanced homogenous grain alignment of E21's unique metal alloy provide greater accuracy and improved consistency from club to club over steel or graphite. The Scandium Metal Alloy employed by E21 also has other performance benefits. E21 shafts are not affected by heat or cold, humid or arid conditions, and do not age like graphite or steel. The stiffness of shafts can be fine-tuned to the most demanding needs of the Tour Professional or average duffer. E21 uses unique engineering design to reduce the shock at contact by 300% as compared to steel (E21's trademarked ShockBlock technology). Players of all level feel this difference, resulting in confidence and accuracy with every shot. E21 COO Bill Dey notes that, "The importance of good golf shafts is often underrated by the amateur golfer. The pressure loads and torque on golf shafts during the down swing through ball contact are tremendous, and have a significant impact on how well the ball is struck. 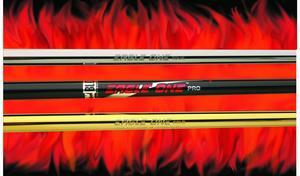 E21 shafts hit longer, more accurately and have better 'feel' at impact than any of the traditional materials." He goes on to say: "I think there will be some interesting discussions following the evaluation of these unique E21 Scandium Metal Alloy shafts." Element 21 Golf Company is a Delaware company trading on the OTCBB and the Frankfurt Stock Exchange (FWB) with offices in New Jersey, USA and Toronto, Canada. E21 holds the exclusive right to manufacture golf products using its proprietary E21 Scandium Metal Alloy. Simply put, E21 clubs are using next-generation technology that delivers marked improvements in distance, consistency, accuracy and feel over any of the most popular products in the $5.5 billion U.S. golf equipment marketplace. Based on this superior performance, a number of high profile golf professionals have switched to or have begun testing E21's Eagle One shafts in recent months. E21 Scandium Metal Alloy is the secret behind this advanced performance. Originally developed for advanced aeronautics in jet fighters such as the MiG, it is 55% lighter and offers a 25% greater strength-to-weight advantage over Titanium alloys, the current standard in the golf equipment industry. E21 Scandium Metal Alloys allows greater freedom to move more weight to the perimeter of the club face in woods and hybrids than any other metal, resulting in a significantly larger sweet spot than any other club head. Additionally, E21 Scandium Metal Alloy shafts are almost perfectly symmetrical at 99.5-99.9%, compared to 60-78% typical in graphite shafts and 80-85% for steel. E21 Golf -- Better Science. Better Performance. Statements in this release, other than statements of historical fact, may be regarded, in certain instances, as "forward-looking statements" pursuant to Section 27A of the Securities Act of 1933 and Section 21B of the Securities Exchange Act of 1934, respectively. "Forward-looking statements" are based on expectations, estimates and projections at the time the statements are made, and involve risks and uncertainties which could cause actual results or events to differ materially from those currently anticipated, including but not limited to delays, difficulties, changed strategies, or unanticipated factors or circumstances affecting E21 and its business. A number of these risks and uncertainties are described in E21's periodic reports filed with Securities and Exchange Commission. There can be no assurance that such forward-looking statements will ever prove to be accurate and readers should not place undue reliance on any such forward-looking statements contained herein, which speak only as of the date hereof. E21 undertakes no obligation to republish revised forward-looking statements to reflect events or circumstances after the date hereof or to reflect the occurrence of unanticipated events.